Claire McCaskill is paying the price for being Barack Obama’s little buddy. Barack Obama’s little travel lapdog is sinking in the latest polls. PPP’s newest Missouri poll finds that Claire McCaskill’s approval numbers have hit their lowest mark since Democrats’ disastrous summer of 2010, and that she no longer leads any of her potential Republican opponents for reelection. Only 42% of voters approve of the job McCaskill is doing to 49% who disapprove. She has particularly poor numbers with independents at 36/53. Crossover support from Republicans is pretty much nonexistent (8% approval) and she’s having a little bit of trouble with Democrats as 16% give her poor marks. McCaskill’s numbers have gradually declined since last March when PPP found her on narrowly positive ground at 46/45. 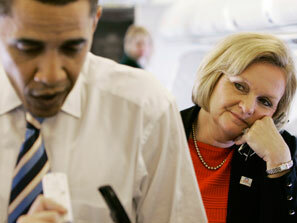 Despite over 70% opposition in Missouri, McCaskill voted for Obama’s unconstitutional health care bill in 2010.